Dylan Buell/Getty ImagesAaron Rodgers proved once again why he’s the highest paid player in football. Aaron Rodgers and the Green Bay Packers pulled off yet another two-minute comeback on Monday night to beat the San Francisco 49ers. 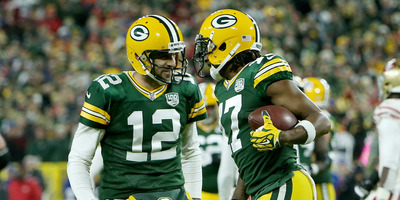 Rodgers and company would put up 10 points in the final two minutes of the game to take a 33-30 win into the bye week. Kicker Mason Crosby shook off a brutal outing last Sunday to send the game-winning kick through the uprights as time expired. Aaron Rodgers did it again. Down a touchdown with just two minutes remaining against the San Francisco 49ers on Monday night, Rodgers and the Packers put together two scoring drives to pull off yet another Lambeau miracle. If it was any other team, it would have been miraculous, but for the Packers, it was just another day on the job. 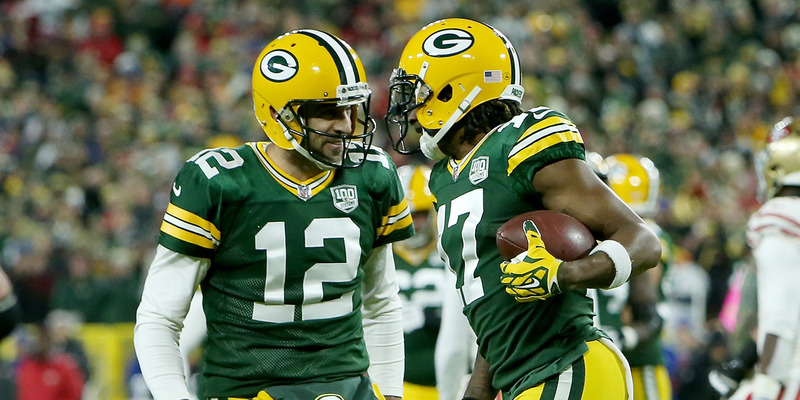 The comeback began with a two-minute drill from Rodgers and the Packers offence. Facing a 30-23 deficit with the ball at their own 40-yard line, the Rodgers marched Green Bay down the field for the game-tying score in just four plays, finding Davante Adams in the end zone on a beautiful throw. On the ensuing possession, San Francisco 49ers quarterback C.J. Beathard looked to take his team down the field for a game-winning score with just over a minute left in regulation. Instead, he got a bit too greedy, and made one of his few mistakes of the night, throwing up a 50/50 ball that was won by Packers corner Kevin King. The interception meant that Rodgers would once again have a chance to win a game in walk-off fashion. With just 67 seconds and no timeouts, Rodgers got to work. The Packers comeback was almost cut short on the first series of the drive, but the home team was bailed out by an illegal contact penalty on Richard Sherman on third down. On the same play, Rodgers had been taken down in the backfield, and looked a bit hobbled getting up, but on the very next snap, he would shake off whatever pain he was feeling and scramble for 21 yards. Rodgers would then throw 20-yard out routes to Equanimeous St. Brown and Adams on consecutive plays, setting up Mason Crosby for the game-winning kick. Crosby was coming off of a rough week, having missed four field goals last Sunday against the Lions. But by Monday night, he had shaken off any lingering doubts. It’s no wonder Rodgers is the highest-paid player in football.